The Rose and Crown is in World Showcase at Epcot. 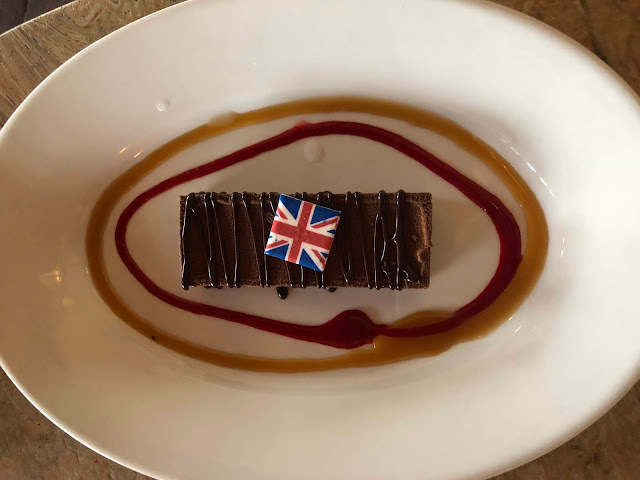 Located at the United Kingdom pavilion, the Rose and Crown serves traditional British food. All guests can jump on a Disney World bus or drive over to Epcot. Walk through Future World and go to the left of World Showcase, towards the Canada pavilion. The UK pavilion is the next one along. The Rose and Crown Dining Room, note that this is not the pub, is 1 Table Service Credit. Check in is located outside the under the archway. A Cast Member will give you a "buzzer" which will light up and vibrate when your table is ready. Whilst you wait you can visit the shops at the front of the pavilion. You can sit either inside or outside for your meal. I much prefer to sit outside and it is always worth asking. If you have a reservation around 19:30, definitely ask to sit outside because you can sit and watch IllumiNations from the restaurant. The outside seating area is under cover and can be used in the Florida rain. The menu is quite British but there also isn't many options. They do have a separate allergy menu. In traditional British fashion, I ordered the masala chicken. Now, I have a lot to say about this. The chicken is a thigh cut, I think. There isn't a huge amount of white meat on it, there is a lot of the red meat. If you are a chicken snob like me and you aren't a massive fan of the red meat then you might have a hard time with this. I do find it weird that they chuck the vegetables in with the curry. When I had this last year they were separate on the side. The sauce is nice, with no spice to it but not too bad. The naan bread is also good and served slightly warm. It didn't seem as nice as when I had it back in 2017, but it wasn't bad. Other people in my party had the fish and chips, which looked incredible. Now, let's talk dessert. When I went in 2017 I had the jaffa tarts which were the best dessert I had in my whole trip. They have changed the dessert menu. I was very disappointed. 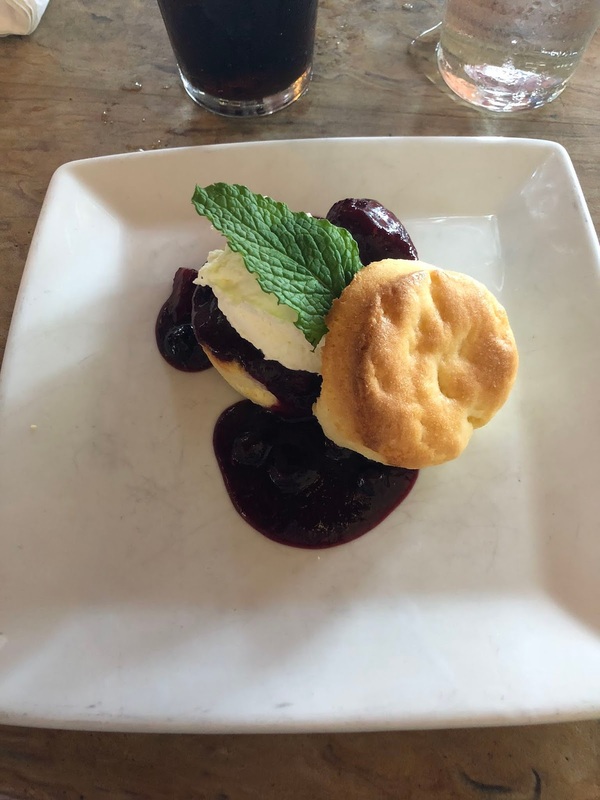 I ordered the lemon scone with a berry compote. First off, and I will say this now, these flavours just did not go well together. I have never had a lemon scone before, always a plain one. This would have been so much nicer if the scone would have been plain! The berry compote was very sour and I didn't like it much. I ended up eating the top bit of scone with the cream and leaving the rest. Someone else in my party had the candy bar. This was essentially a Mars bar. I would have had this, but I don't like caramel and it had a layer of it inside. But it looks really nice! The pub inside is always very busy. You have to walk through the pub to get to the toilets. The pub itself is a highlight on the drink around the world challenge, which I love. However, there was a group of guys in there on a stag party who were clearly very drunk. As I walked towards the bathroom they thought it was appropriate to stroke my leg. Safe to say I was not all that pleased with that. I promptly turned around and went to the restrooms across the street by the shops. Overall, my experience at Rose and Crown this year was not as good as it was last year. I feel like the change in the dessert menu was pretty pants and didn't have many options on it. The main food was nice and it wasn't a bad meal but I wouldn't say it was one of my top restaurants. 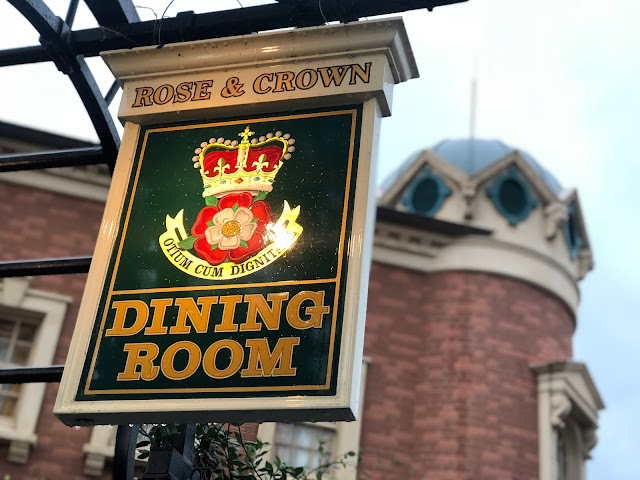 If you are going to go to Rose and Crown for dinner as a family or a couple, don't walk through the pub to go to the toilets. It is worth noting that there is only one toilet in the women's so just walk out the main entrance to the restrooms across the road. I am really disappointed that this wasn't as good as it has been in the past. I would say give this one a miss for a while. I am hoping it gets better again soon.